I've written about skincare a few times on VV before, but today I thought I would update you on my current routine, and specifically talk about what I have been doing to keep my skin clear and healthy looking this winter. For pretty much all of my teenage years, and even my early 20's, I always struggled with breakouts. I tried every product imaginable, but even if they did clear up my breakouts, then I was plagued with dry skin. Especially in the winter, when sky is already dry. It was hard to strike a balance, and all I wanted was to get healthy looking skin. I'm now realizing, in the second half of my twenties, what the key elements to healthy skin are, and that it's important to have a few key elements in my daily routine. Keep reading below to see what they are! I feel kind of silly that I didn't really think more about this when I was younger. 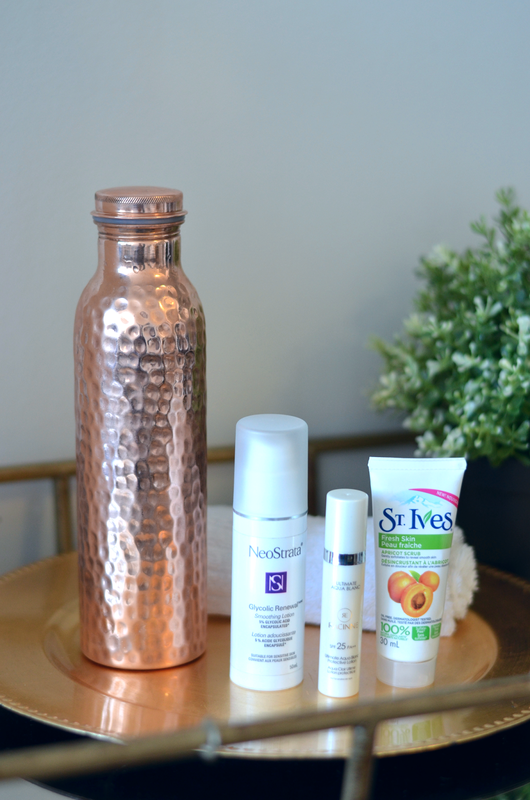 I tried so many products on the market to get clear healthy skin, but I never really realized that just drinking more water could help my skin so much! As a teenager, I always opted to drink milk over water, which means I was never getting enough water in my system. I'm willing to admit it, I don't like 'boring' water. First world problems, I know. But seriously I have only ever really liked sparkling water. 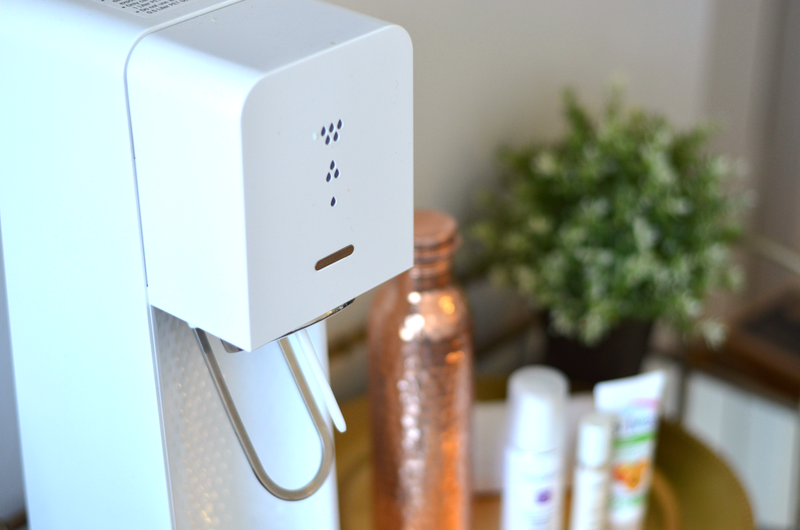 Last year, I decided to treat myself and bought a SodaStream at London Drugs and it seriously changed everything! I started drinking way more water, because I actually liked the taste. It seems crazy looking back now, but my skin seems to be SO much clearer now that I've been drinking all that water. 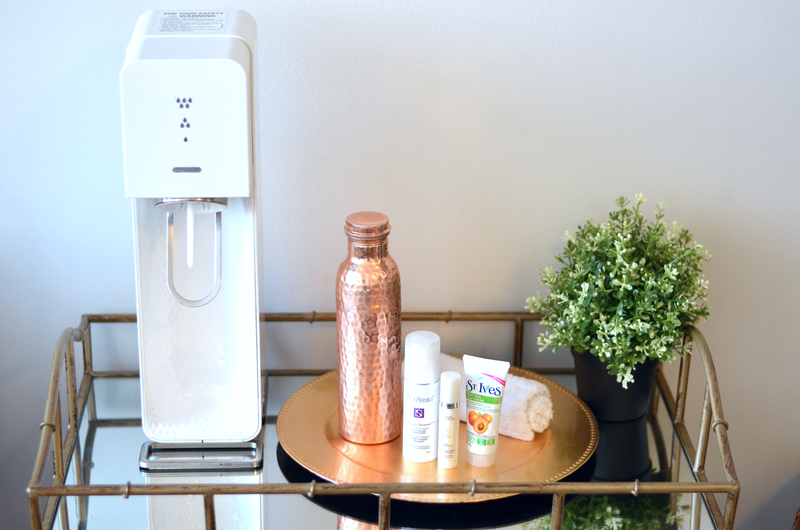 Every night, I put sparkling water from my SodaStream into my copper water bottle from Copper H2O (they're a Vancouver-based company! ), and I leave it in the fridge overnight. Ready for drinking in the morning! Rather than drinking from a glass, this way I have a better idea of how much water I've had so far that day, and how much more I should drink. I try to drink about 2-3 litres a day. 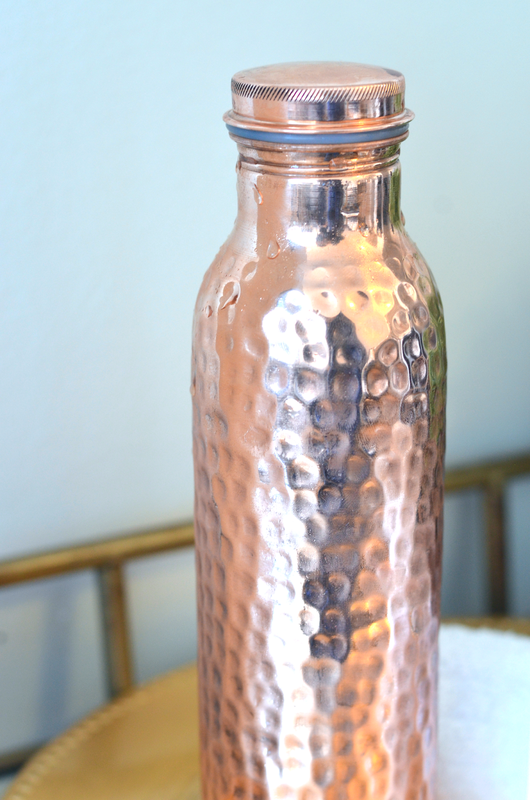 The bottle is made of 100% pure copper, and copper is naturally antibacterial, which is super handy. Have I mentioned I get sick really easily? Yeah, so this is a big plus, especially during cold season. Water stored in a copper water bottle will also become natural alkaline, which helps to balance your body's pH levels (especially if you digest too many acidic foods/liquids) and can help with digestion. Apparently it neutralizes acid in the bloodstream, which leads to increased oxygen levels and improved energy and metabolism too (according to Shape), which is a nice added bonus! Let's be honest though, I mostly like using this water bottle because it's pretty chic looking, so I'm more likely to take it with me on the go. After all, as I mentioned in the section above this, more water drinking = better, clearer skin! To make sure my pores don't get clogged, I like to use an exfoliating cleanser every other day. 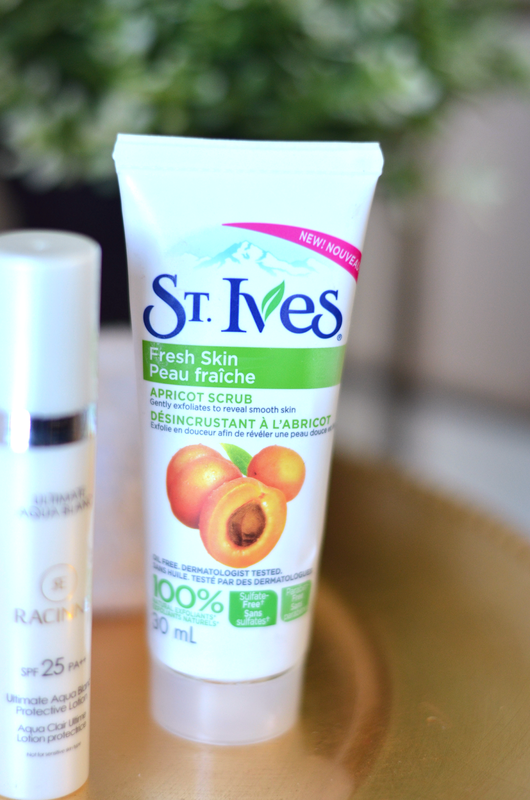 A long time favourite of mine is the St. Ives Apricot Scrub. I absolutely love the smell of this stuff, and I like that it uses 100% natural exfoliants rather than micro beads (which will be banned in Canada, effective 2018). It easily sloughs away the dead skin cells, revealing super soft skin underneath! Glycolic acid is my skin's best friend. It helps to exfoliate the skin, which keeps my pores from clogging in between using my St. Ives scrub. 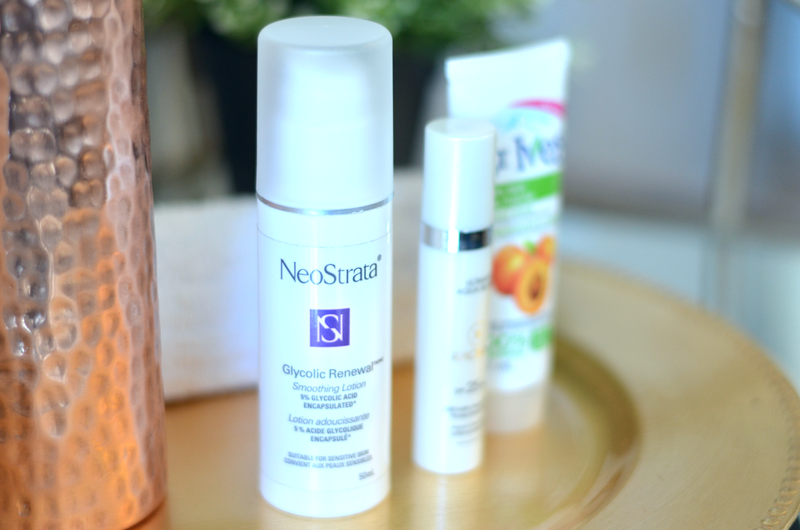 I've been using this NeoStrata Glycolic Renewal lotion for two years now, and I literally use it every single day, morning and night. 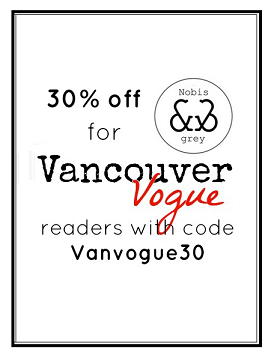 They have a 5% glycolic formula, and a 10% formula, which you can work your way up to after regular use. Healthy skin needs protection. I know in the winter we don't think about it as much, but it's still important to protect ourselves from the sun's harmful rays. I'm very picky about my SPF creams, as I hate the typical sunscreen smell, and its usual greasy texture. 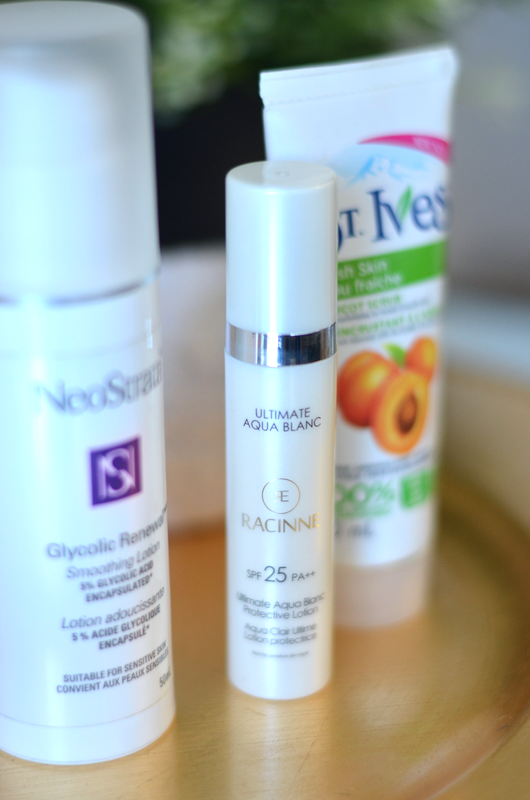 I've been using Racinne's SPF 25 Ultimate Aqua Blanc Protective Lotion and it's a dream. I use it over top of my Glycolic Renewal, before applying my makeup (my BB cream also has SPF). I'm not going to lie, I'm pretty excited to see how my skin turns out like in the long run, years from now. 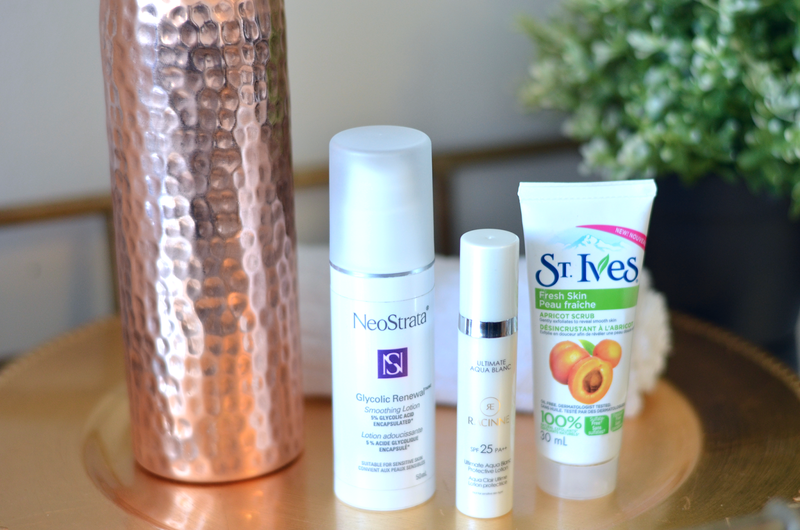 Applying SPF now is going to pay off big time when it comes to healthy skin later in life! Disclaimer: I was provided with a Copper H2O water bottle to review in this post. As always, opinions are my own. Pink Shirt Day: Stand up to Bullying in Style!